Earlier this month, Indiana began issuing gender neutral drivers licenses and state ID cards, using an “X” instead of “M” and “F” for nonbinary, intersex and gender-fluid people. So naturally, state Republicans are devising a plan to make it much harder for anyone to get one. In a 10-to-3 vote earlier this week, Republicans in the House Committee on Roads and Transportation voted to approve SB 182, a law which would require “residents to present birth certificates with a corrected gender marker in order to receive new [gender neutral] identification,” according to Rewire.News. SB 182 now heads to a full vote in the House where Republicans outnumber Democrats 2-to-1. [Getting a birth certificate with a corrected gender marker] entails an expensive and time-consuming legal process. It often requires hiring a lawyer, having a therapist sign off on the gender change, getting a note from a doctor, and appearing in court before a judge. The judge may choose to refuse the request. 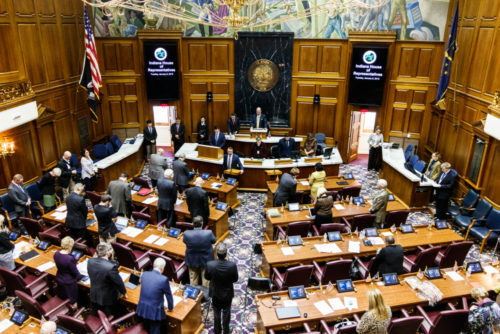 The bill would also affect the estimated 113,764 Hoosiers who are intersex and keep gender neutral IDs out of reach for new Indiana residents who come from states whose birth certificates don’t offer a gender neutral option. Republican supporters of the law have declined any comment on why they support SB 182, leaving advocates to interpret their move as little more than an attack on a small, vulnerable population.